Background: A rugged volcanic landscape with numerous hydrothermal areas softened by forests, meadows, lakes, and streams and crowned by 10,457-foot Lassen Peak. More than fifty lakes attract Canada geese, bufflehead duck, and other waterfowl in summer and fall. Crystal clear streams offer glimpses of American dippers, slate gray birds that fly underwater as they feed. Mule deer and upland birds inhabit high meadows. Audubon's, and hermit warblers summer in the forest among resident black bear, pine marten, Steller's jays and Clark's nutcrackers. Yellow-bellied marmots, golden-mantled ground squirrels, and chipmunks frequent the campgrounds. The Experience: Lassen Volcanic National Park is at a biological crossroads of the Sierra Nevada, Cascade's, Great Basin, and Mediterranean ecosystem with a wide variety of diversity within its habitats. There are numerous lakes and streams and meadow areas within the forests that make for a good diversity of wildlife. There are also spectacular hydrothermal areas which adds to Lassen's diversity. Wildlife and Where to Find It: Manzanita Lake is the most accessible wildlife viewing area with a 1 1/2 mile easy walking trail that encompasses the lake. Species seen in the summer such as bufflehead duck, pied-billed grebe, spotted sandpiper, various warbler species, common nighthawk, muskrat,and mule deer. Summit Lake trail offers viewing of black-backed woodpeckers, gray jays, and Clark's nutcracker. 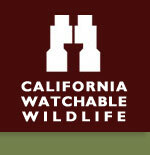 Wildlife viewing from roads and trails offers a variety of wildlife viewing opportunities of both birds and mammals. Viewing Tips: Watch for waterfowl from June through September. Summer visitors may see flycatchers, finches, and glimpse an occasional peregrine falcon or bald eagle. Mule deer, marmots, and squirrels are readily seen from May through September. Excellent roads, best viewing from 150 miles of trails. Kohm Yah-mah-nee visitor center is open at the Southwest Entrance. Loomis Museum and Manzanita Lake Camper service is located near the north entrance. Site Notes: There are 150 miles of hiking trails. The main park road has wayside exibits that highlight the natural and cultural history of the park. The new Kohm Yah-mah-nee visitor center at the SW entrance station is open year round. The historic Loomis Museum and seismograph station located near beautiful Manzanita Lake is open in summer and fall. Butte Lake and Cinder Cone offer wildlife viewing and spectacular volcanic features. Beautiful Warner Valley with rustic Drakesbad guest ranch offers access to Devil's Kitchen hydrothermal area and Boiling Springs Lake with numerous wildlife viewing opportunities. Lassen Dark Sky Festival - Join park rangers, astronomers, and planetary geologists in celebrating all that is out of this world during Lassen's Dark Sky Festival. Special programs, presentations, hikes, and Junior Ranger Night Explorer activities will be offered during the festival. View photos from the Dark Sky Festival on Flickr or a video about the festival on YouTube. Seasonal: The park is open to the public in all seasons. However, all of the park roads close due to snow in the late fall and winter. The roads open usually in early to mid June depending on snow depth. Check the Parks web-site for road information and conditions. Parking Danger: Plenty of pulloffs along the park highway. Be on the lookout for rocks on the roadway. There are no guardrails on the park highway and there are steep dropoffs in numerous places along the highway. How to Get There: Take Highway 36 east from Red Bluff or Highway 44 east from Redding.